Get the best view of Chicago’s Navy Pier Fireworks on the Chicago Fireworks Helicopter Tour! Imagine viewing the brilliant colors illuminating the sky from Chicago’s only Enstrom 480B helicopter with unobstructed views from windows above, below and all around. 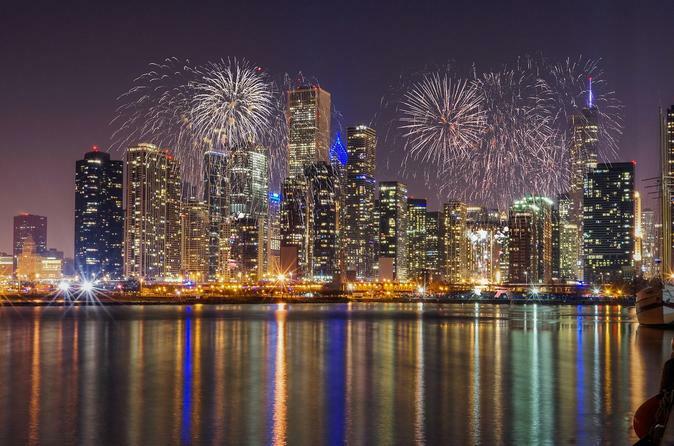 All summer long, Chicago is treated to the brilliant burst of color in the sky during the Navy Pier summer fireworks show every Wednesday and Saturday night. Experience Chicago’s famous skyline and landmarks back lit by the bursts of color and lit up by the nighttime city lights! Space is limited – only one flight will be offered for each Wednesday and Saturday Fireworks show. Reserve your flight today! This private helicopter tour accommodates up to 4 passengers. Chicago’s Fireworks Helicopter Tour offers the best view of the city’s visually exploding fireworks from Chicago’s only Enstrom 480B Helicopter! The Enstrom was designed for the ultimate tour experience, with windows above, below and all around, providing unobstructed views as you soar over the city to catch glimpses of the fireworks from all angles in the sky. All summer long (from Memorial Day to Labor Day), Chicago is treated to the brilliant burst of color in the sky during the Navy Pier fireworks show every Wednesday and Saturday night. Take a special Fireworks Tour and see the city and its landmarks lit up against the sky as you travel above the skyline and its towering skyscrapers! Reserve early to get the best seat in the city, as only one Chicago Fireworks Helicopter Tour will go out each Wednesday and Saturday night. Please note that the fireworks schedule is at the discretion of Navy Pier, and its sponsors, and any changes are out of the control of helicopter tour operator. Your Chicago Fireworks Helicopter Tour VIP experience begins the moment you arrive at Chicago’s only downtown heliport, Vertiport Chicago, located in the Illinois Medical District at 1339 South Wood Street, easily accessible and with free onsite parking. When your scheduled tour time arrives, you and your group will be escorted to the tarmac VIP style, walking the red carpet to where your luxury aircraft awaits. Pause for a photo behind the red velvet ropes next to your luxury helicopter to commemorate this day for you and your group! Your VIP experience continues as your highly experienced pilot soars towards the downtown skyline where you will take in the spectacular sights of the city and magical lights of the night sky. Catch the views from all of the Enstrom’s windows as the brilliant lights of the city sparkle against the starry night sky. Imagine the twinkle of the lights as you get an unparralled view of Chicago’s famous landmarks including: Willis (Sears) Tower, Millennium Park, Magnificent Mile, Soldier Field, the Museum Campus and more! Learn the fascinating history of Chicago’s famous landmarks and historical sights as your pilot narrates your flight. This breathtaking tour aboard the Enstrom offers amazing views of the Chicago and the spectacular Navy Pier Fireworks that are not available on any other helicopter. The Chicago Fireworks Helicopter Tour is a private flight for up to 4 passengers and a perfect, special evening for a family, a group of friends or to entertain out of town guests. Reserve early to secure your spot on this limited tour!